I started painting about a year ago, and have taken 4 classes since then. Two figure classes, one portrait class and one still life class. I mostly paint people, but I think learning all types of painting will make me a better painter. Naturally, in Paris, I wanted to paint. I searched out some of the local instructors and institutions, hoping to find a workshop where I could paint and make some friends. Unfortunately, they all shut down in July and August. And when I say all, I mean ALL. No workshops. No classes. I do find a group that does a plein air gathering one Sunday a month, but it seems dicey to me because you have to call the morning of, to find out where it will be. Between my spotty phone service and my lack of familiarity with Paris, this seems problematic and potentially like a waste of about $100. I also find a couple that does expensive one-day junkets for about $350, a guy who does a 3-hour lesson for $300 American and another guy who does a 3-hour lesson for about $110. I’m not very impressed with the work shown online for either of the first two, so I decide to go with the most affordable option, Monsieur Paul, even though I have not seen his work. His website offers an English page, but shows no paintings and has no email contact. His studio is called Paris Loisirs Culturelle. I talk to Monsieur Paul on the phone. His English is quite good, and he sounds charming. He has no email contact and I have spotty phone service. But we set up an appointment and just agree that we will be there. He says I can look at the work, and if I like it, then we can do a lesson immediately following. If not, there’s no obligation. How artistic and quaint. Sounds like most of the professors I have back home. Humble, kind and low pressure, so I feel comfortable. There’s no buzzer at the apartment, so I’m to tap on the window with the curtains when I arrive. Talk about old school! LMAO! I find out when I get there that this is all by design. He gets deluged with email inquiries that never amount to anything, and then he has to spend significant amounts of time answering them, because it is rude not to. So he just dropped the email. He figures anybody serious will just call when they get here. There are abstract paintings hanging all over the atelier (studio). Abstract paintings are not my thing, but most of them look competent, and the colors are excellent. There are couple that I find to be really good, and a few impressionist works that I like. I think I can learn from Monsieur Paul, so I decide to stay. He is most gracious, understanding that the heat is unbearable. The studio is nice and cool, probably the least humid place I’ve been in Paris. He offers me a Coke, thank god, and lets me recover from the long hot trip over, which involved the first time I’ve gotten confused on the Metro since I’ve been here. As I cool off, we talk about what my goals are for the session. I show him some of my paintings on my iPhone. I am a newbie to landscape painting. Done one workshop, and that’s it. So there are some things I’m struggling with, most having to do with editing … how much detail, what to leave out, etc. He looks at my paintings and I am reminded of how subjective art is. He thinks my still lifes are really good, my few landscapes are good and my portraits are bad. Not surprising, since he likes abstract work and impressionist work, and the portrait class I took was realistic. I disagree with his assessment, but it’s always interesting to hear. I think my landscapes are awful and my portraits are pretty good and keep improving. 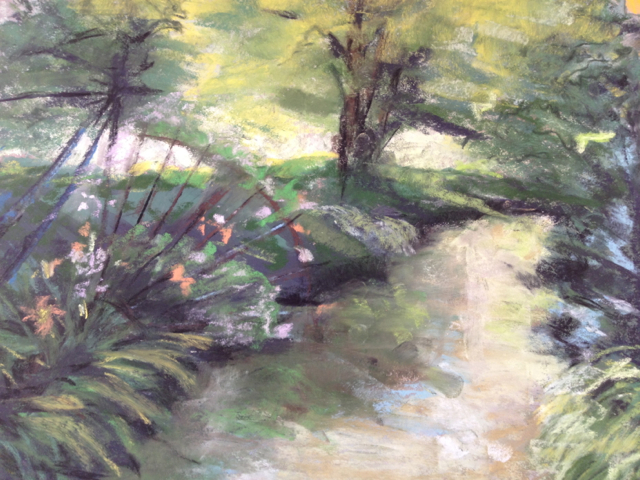 Landscape I did on my own before my lesson at Monsieur Paul’s. Pastel on sandpaper, 11 x 14. Even though I’m reluctant to do acrylics, which I generally do not like, he persuades me for this exercise that it’s a good idea. He has me pick a painting to emulate, so I choose Monet. Normally, I would not copy someone else’s painting, but as a learning exercise, it’s a good thing. Actually something I’ve been wanting to do. He demonstrates the impressionist technique for a bit, then laughs. He says he can tell I’m eager to start. I am. Monsieur Paul puts on some classical music and turns the easel over to me. The acrylics are pretty nice and don’t dry as quickly as the Golden Acrylics I use at home. This is a bonus. I start daubing on the paint as instructed, which is new to me. I find that the acrylics dry darker, so I feel a little frustrated that the colors are not what I intended. It’s also a primary selection of colors which I don’t normally mix from, so getting the right colors is challenging to begin with. He encourages me to get the whole canvas covered with paint, then go from there, but I’m finding it hard to do quickly because of the mixing issues. Finally, I get it mostly in shape, and he’s right … it does make it easier. From there, I finesse, and it keeps improving. Nothing spectacular, but I’m only learning, so my expectations are not high. Monsieur Paul makes suggestions periodically. I am quite glad that he doesn’t hang over my shoulder the whole time. He chats for a while, then goes into the back room and reemerging every 20 minutes or so. He says the same thing my instructor at home says: “Your sense of color is excellent.” This makes me smile. I think he might be desperately searching for something encouraging to say in the face of bad painting. But every painting I’ve ever done looks dismal for the first couple of hours, so I plug on. I make the tweaks Monsieur Paul suggests, also blissfully enjoying the cool air for a few hours. It’s amazing how not feeling sweaty and disgusting is invigorating. The three hours come to an end, and I am satisfied. It is nothing to write home about, but it is the first painting I’ve done where the water actually looks like water. I love the colors of the trees, not the sky or the water too much. Again, they dried darker than I intended, even after I painted over them. The shadows in the water are not good and the horizon line through the trees is too overt. But overall, not bad for my first landscape with paint, let alone my first with acrylics. Three hours was not enough time; could have used another three. But I think I learned the lesson, which is the most important. I wash my hands and get ready to pay up. But I’m surprised when Monsieur Paul asks if I’d like a glass of wine. I have nowhere to be, so I say yes. And then we sit for a couple hours, drinking wine and talking about life and art. The rose’ is good here, not too sweet. He also plies me with chocolate wafers. Not like he had to force me; it’s chocolate. The conversation is great … relaxed, intelligent, sophisticated. I love it. He admits that my painting scared him at first, but then it turned out rather nicely. I chortle at the honesty; I am not surprised at all. He reiterates that my sense of color is really very nice, so I decide to believe him this time. Normally, I’m a one-glass-of-wine kind of girl, but when he goes to refill my glass, I figure, “WTH, I’m in Paris.” It’s not like I have to worry about driving. I go with the flow. How Parisian of me. Monsieur Paul tells me that based on my outfit, he would never have known I wasn’t French. Of course, I love this, whether it’s true or not. It makes me happy. And sometimes we can choose to be happy. We should always make this choice. As I sit in the atelier, I become more and more impressed with one of Monsieur Paul’s landscapes. I love it and the colors, and consider asking him if it is for sale. But then I remember I don’t have anywhere to hang it. I get the sense that Monsieur Paul is out to make a living, but he is also on a mission to help artists. He feels it is important to keep his rates reasonable, which is a novelty in Paris in any business as best I can tell. Monsieur Paul shares some of his theories on marketing with me; it seems everyone has ideas about marketing that isn’t in the business, ha! He offers to introduce me to another of his students who is also in marketing; he thinks we will hit it off because they argue about marketing all the time, and basically she agrees with me. I say “sure;” I could use some friends in Paris. After staying a couple hours, during which he refilled my glass, the bottle of wine is done, and he mentions he has an appointment. Oops, I didn’t notice that he appeared anxious to leave, but I perhaps overstayed my welcome. 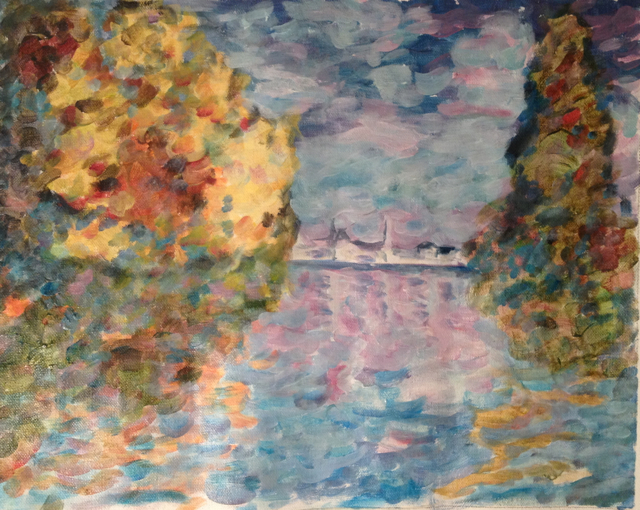 Monet replica learning exercise I did yesterday at Monsieur Paul’s. Acrylic on canvas, about 12×16. I pay up, thank him profusely and head back to the apartment with my semi-competent little imitation painting, happy. Only in Paris. This is what I came here for. You should be most pleased. Your instructor nurtured your talent. LMAO; yes, after he slapped me down on my portraits, he built me back up! I love your painting !!!! Really !!!! It will be a wonderful memory of your journey to Paris. I’m sure you can find the perfect spot for it. It’s just a copy of a Monet. Different than his, to be sure, but he did all the hard work, I just imitated it in order to learn the technique. My next original painting was much better, though. Haven’t had a chance to photograph it yet but I will post it soon. Jeanne, Finally have viewed this web site. Your narratives are wonderfully informative. I don’t know how you had the time to write it down and site see and paint and etc. You should write a book. And you are brave, courageous too. Are you in Tim’s Tues. class? I should show you what I painted in France. Bud (Louis) Kilgore Remember me, I am in Tim Widener’s Thursday Portrait Class? Bud, I shot you an email. Did you get it?